ISAF and Rolex are proud to announce the Nominees for the ISAF Rolex World Sailor of the Year Awards 2008.ISAF received nominations from across the world representing all aspects of the sport in two categories - male and female - and the following 10 nominations have been shortlisted. The qualifying period is the year up until 1 September 2008 and all achievements during this time are taken into consideration. The winners will be selected by the ISAF Member National Authorities, the national governing bodies for sailing around the world, who are now invited to vote for the one male and one female nomination who they believe most deserves the Award. The winners will be announced at the ISAF Rolex World Sailor of the Year Awards presentation and dinner which is being held on Tuesday 11 November 2008. The venue for the event is the stunning Quinta de Jarama in Madrid, Spain. 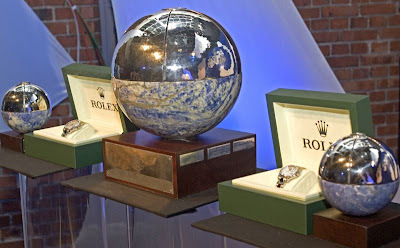 Each winner will be presented with the prestigious ISAF Rolex World Sailor of the Year Award Trophy and a distinctive Rolex timepiece.